When getting more somehow means getting less. I first read Yesterday's Kin when it was a finalist (and eventual winner) for the Nebula Award in 2015. I thought it was fantastic, though I also wanted much more of the story - more on the genetics, more on the story of contact and its implications, more of everything. It was a complete story, but like the best stories, I wanted more of it. Tomorrow's Kin is a novel length expansion of Yesterday's Kin that uses the original novella as a launching point. The story of first contact with aliens who turn out to be human themselves, though separated by time and across space, is still there, but works as the first section of the novel. The rest of Tomorrow's Kin is the story of what happened after the novella ended. 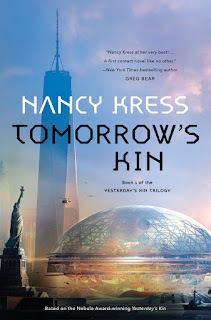 If Tomorrow's Kin was an otherwise standalone novel, I would have been disappointed that Kress did not go farther in exploring the Earth / Deneb storyline. 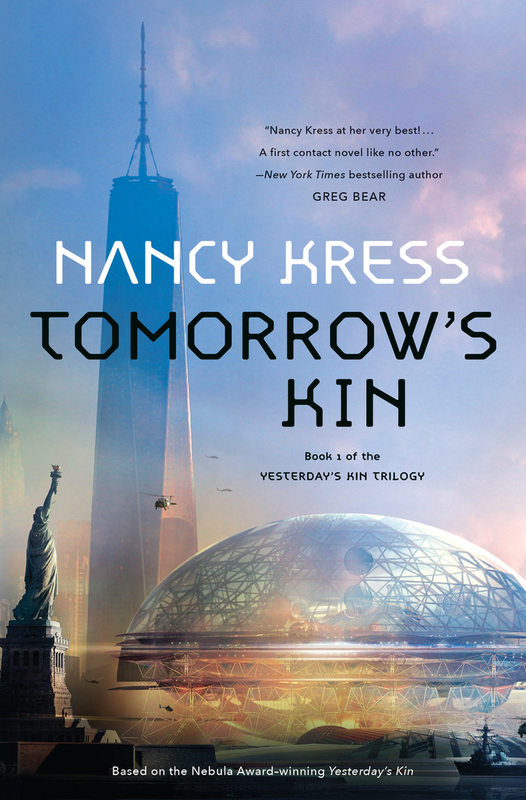 As it happens, Tomorrow's Kin is the first volume of the Yesterday's Kin trilogy (that's a lot of kin, isn't it?) and where so much of this novel is focused on the situation on Earth, I fully expect the humans of Earth will visit the Deneb home planet and that story arc will be more fully developed. Once we move past the conclusion of Yesterday's Kin, the focus remains on Dr. Marianne Jenner as well as pushing in tighter on that of her grandchildren. This is character driven science fiction. Kress explores the impact of Earth's interaction with a spore cloud that was initially described as a world killer, but she does so through the lens of characters who have become as familiar as family. To a reader not steeped in the nuance and minutiae of science, the unpinning science of Tomorrow's Kin comes across as fully rigorous as anything in a more traditional "hard" science fiction novel. Kress does not engage in interminable info dumping. I read Tomorrow's Kin not long after finishing the latest Charles Stross novel, Dark State (my review). There is no real point of comparison between the two novels, except that I generally love the ideas that Stross plays with and wish he did a better job at actually telling the story. That generally isn't the case with Nancy Kress. She is a far more accomplished writer and is far smoother with her storytelling. Kress's ideas are just as big and just as bold, but they are strongly integrated into the story. The biggest criticism I have with Tomorrow's Kin is that it feels too spare, too empty for the big ideas Kress is playing with. Without knowing where the next two books are going, the trilogy already comes across as two books worth of material spread across three. Perhaps it is because Yesterday's Kin was so tightly packed that Tomorrow's Kin somehow feels lacking. I am absolutely going to read If Tomorrow Comes, but I expected a bit more from the expansion of Yesterday's Kin. Nancy Kress almost delivered it, and my hope is that the next book fulfills that promise. Tomorrow's Kin was so close. The quality is there, but there just isn't enough meat to be fully satisfying. Penalties: -1 because the back two thirds of the novel didn't feel as fleshed out as the opening third. POSTED BY: Joe Sherry - Co-editor of Nerds of a Feather, 2017 & 2018 Hugo Award Finalist for Best Fanzine. Writer / Editor of the mostly defunct Adventures in Reading since 2004. Minnesotan.